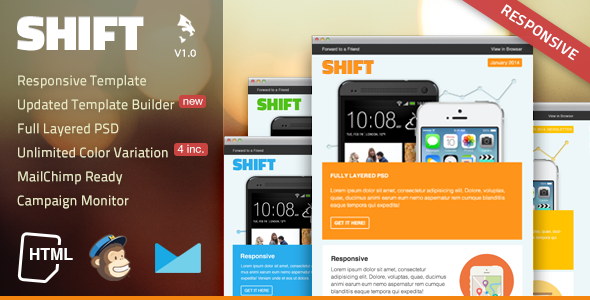 Shift is a Fancy Multipurpose and Responsive Email Template, tested on all major Email Clients and ready to be used on MailChimp, Campaign Monitor. Highly customizable with a Powerful Template Builder we provide in each Email Template we build. Item Reviewed: Fancy Multipurpose and Responsive Email Template 9 out of 10 based on 10 ratings. 9 user reviews.